As part of our work supporting musical activities for very young children we are always looking to identify examples of good practice to share and celebrate. 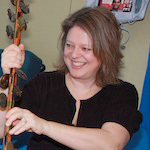 The members of our London Early Years Music Network (LEYMN) work in many different settings and our latest case study is written by Vanessa King about her work in Neo Natal hospital wards. Vanessa shares her insights into this multiple-partner project and the impact it can have on all those involved.